The Abelson Scopeworks Omniscope is an anamorphic pinhole camera. 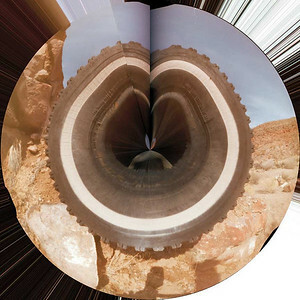 It provides a bizarre 360 degree view.. The medium format negative is several inches long. The characteristic black bar near one edge is a roller that helps hold the film in place. An interesting thing to do with these images is to apply the Photoshop Polar Coordinates filter. 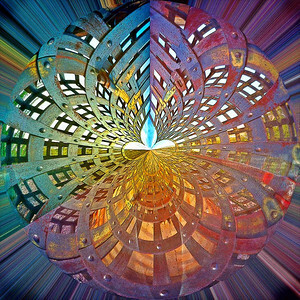 Flipping the image vertically and then wrapping it with Polar Coordinates will yield a different result. Check out http://www.f295.org/Pinholeforum/forum/Blah.pl?b-cm/m-1138590844/ for a wooden version of this pricy aluminum camera. Pahranaget Tire Raw Image - While visiting the Pahranagat Wildlife Refuge I found an old, abandoned tire on the side of the road. This is the image recorded on the film. 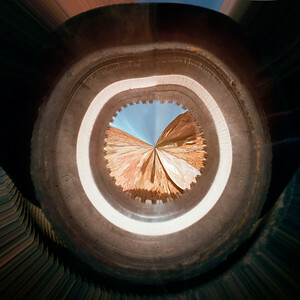 Pahranagat Tire - Inside Out - This is the tire wrapped the other direction with Polar Coordinates. It has been cleaned up considerably. Note that the tread is on the inside of the tire. You can read the tire identification, but it is facing the wrong way. This is a reference photo for the next three images. 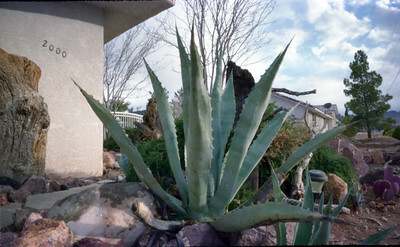 This is an agave photographed with a Curva 120 pinhole camera. Agave Weberii shot from the top looking down into the plant. This is the recorded image. 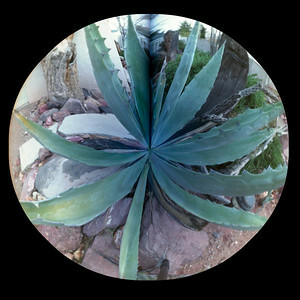 Agave Weberii image wrapped with Polar Coordinates. 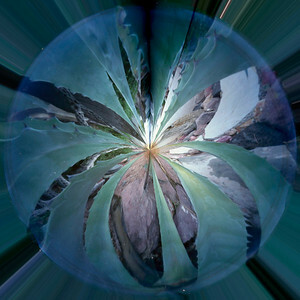 Agave Weberii image wrapped the other way with Polar Coordinates. This image started out as an Omniscope exposure of a "Prisoner Transport Cage" at the Heritage Museum. It has had Polar Coordinates applied.